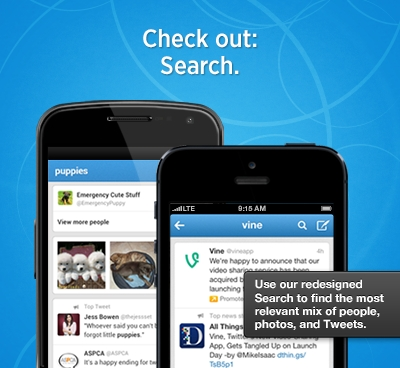 Twitter for Android gets updated with better search and discovery features | Android Blast! Twitter for Android has been updated brining improved search and discovery of new Tweets. The Discover tab now combines all Tweets, Activity, Trends, and follow suggestions. You can also go right into Activity and Trends from new previews from the Discover tab. Search results have a similar merging of results from Tweets, photos, and accounts, in one stream. The full list of changes are listed below. Discover: Now all the content in Discover � Tweets, Activity, Trends and suggestions of accounts to follow � appears in a single stream, on both iPhone and Android. You can also dive into Activity and Trends from new previews at the top of the Discover tab. Search: Search results now surface the most relevant mix of Tweets, photos, and accounts, all in one stream (similar to the stream in Discover). We�ve also added a new search button to Twitter for iPhone, letting you search from anywhere within the app. (This button was already available in the Android and iPad apps.) Look for the magnifying glass icon next to the button you use to compose a Tweet. Connect: To provide a simpler experience in the Connect tab, the default view is now Interactions, which shows you new followers, retweets and mentions. If you prefer to view only your mentions in Connect, you can adjust the default in settings � find the �Connect tab� option and select �Mentions only�. Check out the new version in Google Play.